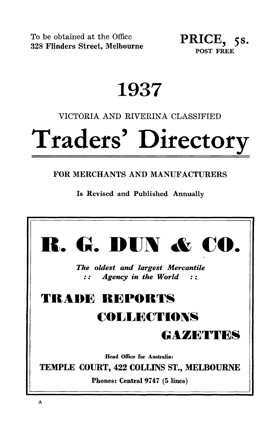 This classified Traders Directory was published for merchants and manufacturers. The Buyers’ Guide, in alphabetical order by merchant and supplier, lists the manufacturers and warehouses of a range of products, and includes addresses and descriptions of them. The Traders’ Directory, also in alphabetical order by town, lists the main businesses and their owners in the towns and townships of Victoria. In some cases, the addresses of the main businesses have also been included.